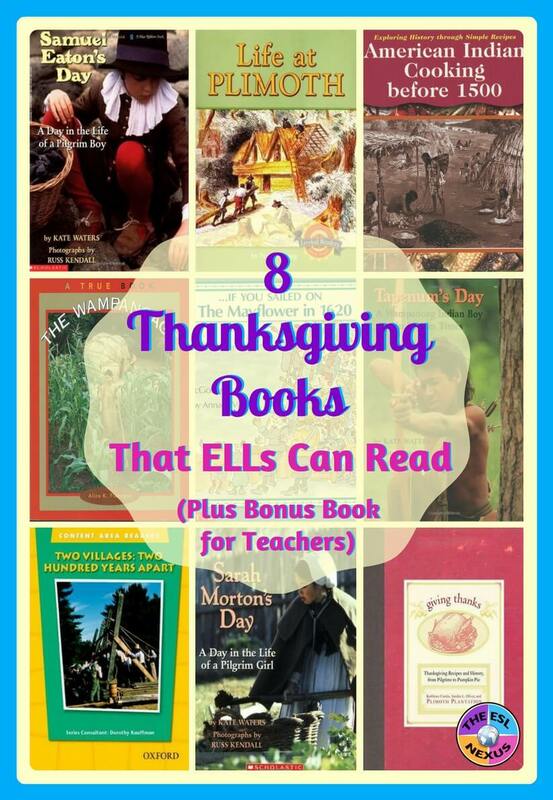 8 Thanksgiving Books That Even ELLs Can Read! This list of 8 informational texts includes books about the Pilgrims, the Mayflower, the Wampanoags, and life at Plimoth Plantation. Some of them are probably familiar but others may be new. I have classified the books by reading proficiency level, using the WIDA Performance Definitions for Reading as a guide (available as a download on this page). I used all of these books when teaching American history to my ELLs. If you have used any of them with your students, or have activities you did with these books, please let us know in the Comments section below. Life at Plimoth by Norm Chang; paperback. 7 pages of text with illustrations that look like photographs on every page. There are three comprehension questions and one writing task at the end of the book. This book uses a large font size and has plenty of white space to make it easier for ELLs to comprehend the text. 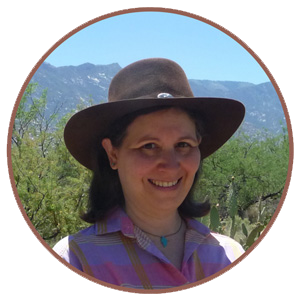 Two Villages: Two Hundred Years Apart by Dorothy Kaufman (series consultant); paperback. 10 pages of text about Plimoth Plantation and the Wampanoag Homesite. Written as if a modern-day girl is visiting these places, the book has photographs on every page. Some pages also include diagrams or maps and vocabulary words glossed in text boxes that overlay the pictures. The second half of the book is about Old Sturbridge Village. There are vocabulary activities and a glossary at the end of the book. 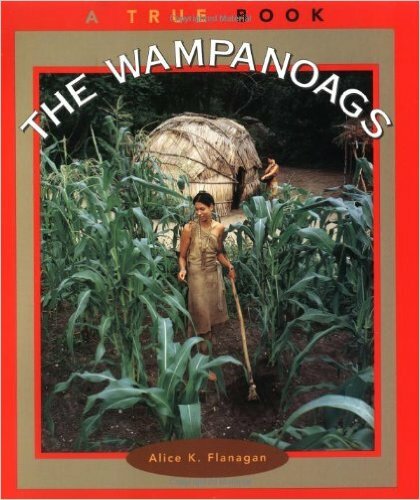 The Wampanoags by Alice K. Flanagan; paperback. 40 pages of text about the beliefs, history, traditional culture, interaction with the Pilgrims, and life today of this Native American Massachusetts tribe. There is a two-page spread about Wampanoag pottery. The font used for the text is large but the sentence structures are more complex in this book than in the previous books mentioned. Lots of photos are included, which all have informative captions. Resources for more information, a glossary and an index are provided at the end of the book. A newer edition of this book is available. 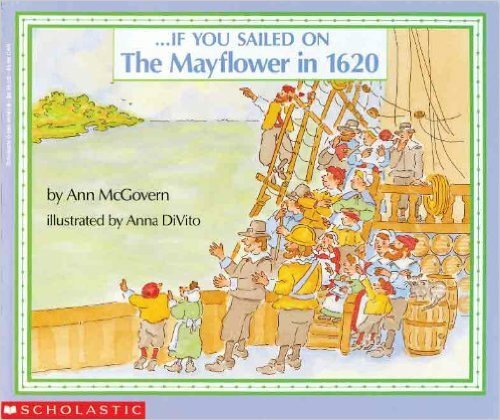 ...If You Sailed on the Mayflower in 1620 by Ann McGovern; paperback. 81 pages of text plus a 2-page cutaway diagram of the Mayflower. Written in question-and-answer format, information about life on the Mayflower comprises about half the book and the remainder is about how the Pilgrims lived in Plymouth. There are illustrations on many pages but no accompanying activities for students nor glossary or index. 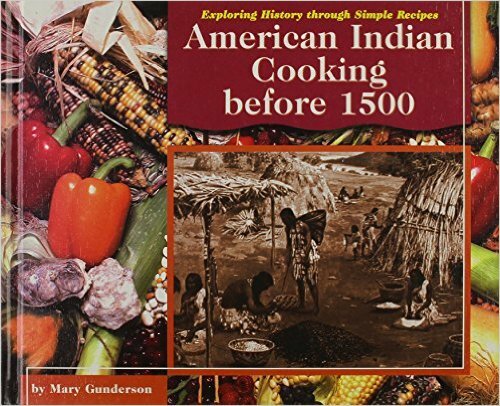 American Indian Cooking before 1500 by Mary Gunderson; hardback. 24 pages of text about the culinary customs of Native Americans in eight regions of what is now the United States, plus a general introduction to Native American societies before Columbus and a page about Cahokia. Each region is described, with special emphasis on its food, and then a recipe typical of that region is provided. Also includes two pages with customary and metric measurements, info about safety in the kitchen, and an illustration depicting numerous types of equipment used for cooking. A glossary, resources for further information, and an index are at the end of the book. 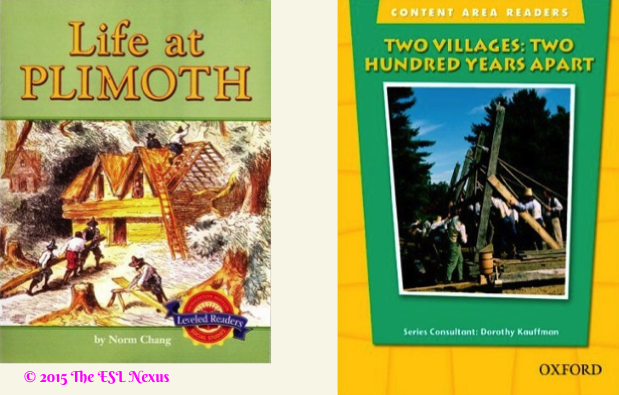 I classified these three books at this level because of the specialized content-language used throughout; however, because they have lots of photographs, ELLs at WIDA Level 4 may also be able to comprehend some of the text in them. All three paperback books are written by Kate Waters and published by Scholastic. Sarah Morton’s Day: A Day in the Life of a Pilgrim Girl by Kate Waters; paperback. 30 pages of text. Through photographs, Sarah Morton describes how she spends a typical day at Plimoth Plantation, from morning to night. 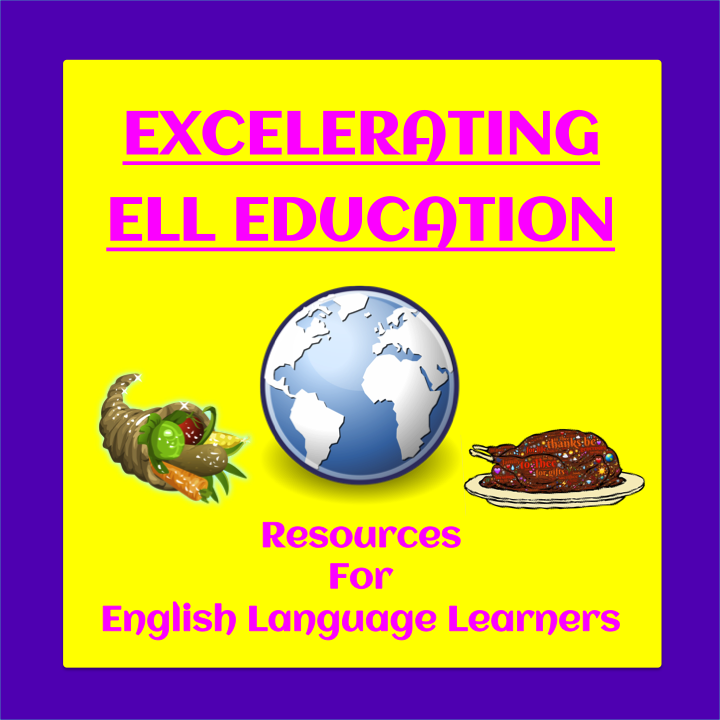 The text may be difficult for ELLs because her manner of speaking echoes that of the 17th century Pilgrims and uses a lot of vocabulary that is not common today. There is a glossary at the end of the book, along with an explanation of what Plimoth Plantation is and short biographies of the real Sarah Morton and the girl who portrayed her for this book. Samuel Eaton’s Day: A Day in the Life of a Pilgrim Boy by Kate Waters; paperback. 38 pages of text. A companion to Sarah Morton’s Day, this book tells the story of Samuel Eaton by describing his life at Plimoth Plantation from the time he gets up in the morning to when he goes to bed at night. Written as if Samuel himself were talking, the book may be hard for ELLs to comprehend due to the language used but there are plenty of photographs that accompany the text, which should help. At the end of the book, lyrics to a song that was referred to in the text are included as is some info about harvesting rye, the clothes men wore, and the Wampanoag Indians, along with a glossary and biographies of the real Samuel Eaton and the boy who portrayed him for this book. Tapenum’s Day: A Wampanoag Indian Boy in Pilgrim Times by Kate Waters; hardback. 35 pages of text. This book complements the two books about Pilgrim children mentioned above. Many of the numerous photos are full-page spreads. This book might be easier for ELLs to understand because the boy uses contemporary language to describe his life. Although there are lots of specialized words as well as Wampanoag words included, the glossary at the end of the book defines the terms and offers a pronunciation guide to the Native American words. Also at the end of the book is a map of Wampanoag lands in the 1600s and a short description of the Wampanoag, plus a brief bio of the boy who played Tapenum for this book. 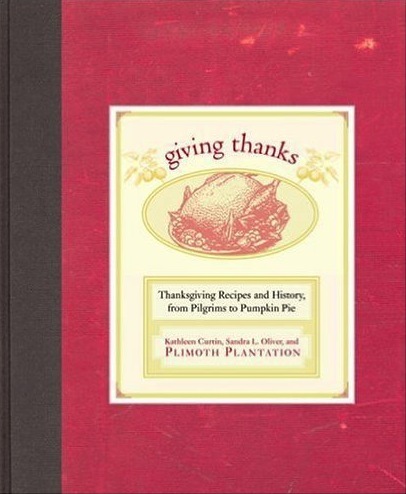 Giving Thanks: Thanksgiving Recipes and History, from Pilgrims to Pumpkin Pie, by Kathleen Curtin, Sandra L. Oliver, and Plimoth Plantation; hardback. 192 pages in length, this book details how Thanksgiving was probably celebrated by the Pilgrims and then proceeds to describe how it has been celebrated throughout the United States from then til now. Filled with background information, recipes, photos, primary source info about Thanksgiving, and a two-page bibliography plus an index, you will never think of Thanksgiving the same way again. I bought this book at Plimoth Plantation in 2014 and am looking forward to making the Boiled “Sallet” of Spinach (a warm spinach salad), which is a recipe from 1623, when I celebrate Thanksgiving this year.